by donating a tree or park bench in one of our parks! Trees are sold at cost, prices range from $250 – $450 depending on the type of species selected and size of the tree. Tree donations are accepted year round, but are only planted from spring to fall (weather permitting). Due to our repeating hot dry spells from late June to September, evergreen trees will only be planted in the fall. After planting, all trees will have a 25 gallon water bag placed around the base of the trunk and regularly watered for the first two years or until established. Should your donated tree become damaged or die it will be replaced at no cost to you. Peripheral plantings, landscape enhancements or markers are not permitted. For those who like to walk in the parks, a bench donation might seem especially appropriate. 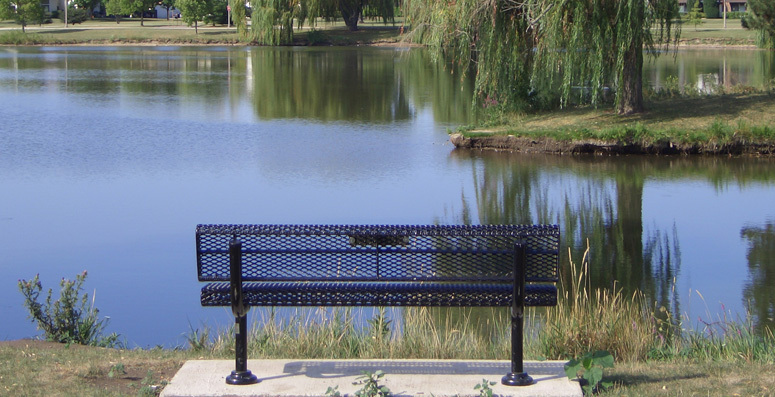 The District has selected a black park bench that will complement any of our parks. Benches may be purchased at cost for $750 and personalized with a bronze plaque for an additional cost. Bench placement is based on space availability in each park. Tree & Bench Donation forms must be submitted by October 15 if installation is preferred before December 1. The bronze plaques require six weeks production time. Donation forms are accepted year round, but spring plantings will not begin until the ground thaws in mid-March. Tree and bench donations, including the personalized plaque, has a ten year limited warranty. The District will notify the person who donated the tree or bench if it has to be removed due to age or disease after the warranty has expired. If a tree, bench, or plaque is damaged by Park District staff, contractor, or vandals, it will be replaced regardless of the ten year warranty. Complete the Tree & Bench Donation Form and return to the Parks Maintenance Facility, 1400 Indianwood Drive. For more information, contact Rick Krocza at rickk@vhparkdistrict.org or 847-996-6831.